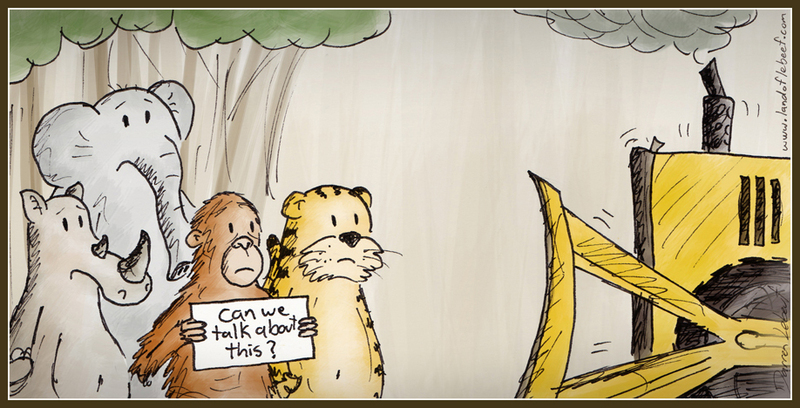 This cartoon was inspired by an online petition I recently became aware of to save a very large area of forest in Indonesia where apparently many beautiful endangered species (including rhinos, elephants, orangutans, and tigers) still roam free (in my head I picture them all frolicking in meadows and having picnics together). Anyway, it is horrible to think of an army of bulldozers coming to this utopia and destroying it. The petition can be viewed here. Please sign, share, and take a moment to ponder about the wonderful creatures that inhabit the earth.